Villa Marea is only 150 metres from the entrance to the Cuvi Natural Park and 300 metres from the sea and the famous Cuvi Bay in Rovinj. It provides free Wi-Fi in public areas. The air-conditioned accommodation features furnished terraces and views of the Villa's outdoor swimming pool. The historical old town is only a 20-minute walk from the Marea. The Villa's position close to the beach and the natural park makes it a great starting point to explore the natural surroundings. When would you like to stay at Villa Marea ? Air-conditioned studio decorated in light tones, featuring satellite TV, a kitchen, a spacious bathroom and a terrace. Air-conditioned room decorated in light tones, featuring satellite TV, a fridge, a spacious bathroom and a terrace.Please note that extra beds are not available in this room type. 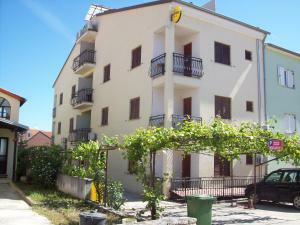 With 2 spacious bathrooms, double bedroom, living room with sofa bed and a terrace. Each day we'll check prices and send you an email for your selected dates at Villa Marea. If you don't have specific dates but would like to check prices for say next weekend or say next month we can check the price too. Click to write a review and share your experience of Villa Marea with other travellers.